Horizon Ridge are a group of fine multi-instrumentalists and seasoned singers known for their intuitive and tight harmonies. 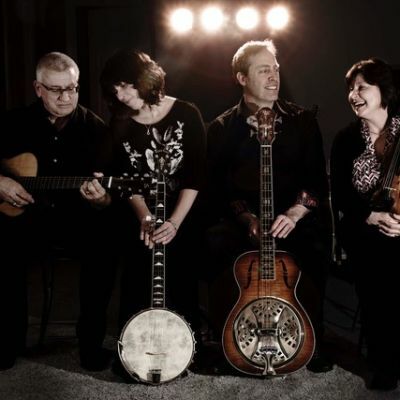 Helen Goodchild, Steve Goodchild, Peter May and Dianne Quinton take their inspiration for music from their roots and subsequent journeys near and far. Horizon Ridge brings an engaging stage presence to their performances. Audiences love to hear them sing a cappella! With influences spanning traditional and contemporary folk, country, rock and gospel, the band is versatile and adventurous. Horizon Ridge released their first CD, Enough is all you need, in summer 2016 to audiences in Newfoundland, Alberta and British Columbia. A mix of original and cover songs, it showcases the band's ability to move effortlessly between different musical styles and genres. Many thanks to CKUA for bringing us to the airwaves! The band members, who are based in Calgary, Alberta, have played festivals, music clubs and concerts in Canada, the US and UK. They have also taught a range of musical workshops in individual and group settings. Appeals most (but not limited) to: All ages; special appeal for those who love intricate harmonies and good stories in songs. We chose songs to fit our audiences/events. Our availability varies and current bookings are listed on our website at www.horizonridge.ca. We travel for gigs and are easily accommodated (only 2 rooms required). Please contact us if you need music for your venue or event. We'd love to come play for you!